Cochineal Dye > What is Cochineal - cochineal insects or plant seeds? Cochineal Dye Home > What is Cochineal - Cochineal insects or plant seeds? Cochineal insects or plant seeds – plant or animal? 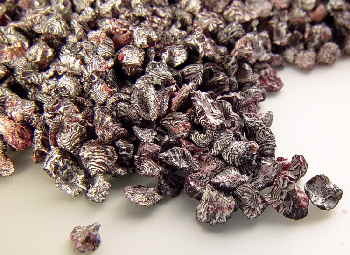 Dried cochineal looks like small silver-grey peppercorns or plant seeds. Before microscopes where in use, European scientists argued for a long time as to whether cochineal was a plant, an animal or a mineral. We now know that cochineal is a female scale insect that lives on prickly pear cactus plants (Opuntia or nopal) native to Central and South America. Scale insects are plant-sucking bugs that are covered by a white fluffy, protective coating and cochineal bugs produce carminic acid as a by-product to deter predators. Crimson, fuchsia, raspberry and scarlet reds can be obtained from cochineal. The red colorant is used in drinks (e.g. Campari) and in foods (under the code E120), and in drugs and cosmetics. Polish cochineal, Kermes, Lac and St John’s Blood are produced from different scale insects that are more or less closely related to true cochineal insects. The term cochineal may be applied either to the living or dried cochineal insects or to cochineal dye which is obtained from them. It takes about 155,000 cochineal insects to produce 1 kilo of cochineal dye. More on Cochineal Insects (cochineal bugs or cochineal beetles)? Click here.